Miles Prower, better known by his nickname "Tails", is an eight-year-old, two-tailed yellow fox from the Sonic the Hedgehog series, and the sidekick and best friend of Sonic. He is a mechanical genius who has the ability to spin his tails like a propeller, and thus fly. In Mario & Sonic at the Olympic Games and Mario & Sonic at the Olympic Winter Games, he is voiced by Amy Palant, but in Mario & Sonic at the London 2012 Olympic Games until 2014, he has been voiced by Kate Higgins. He is now voiced by Colleen Villard. "Miles Prower" is a pun on "miles per hour". Tails participates in Olympic events in Mario & Sonic at the Olympic Games. He is a Skill type player, with skill and stamina being his best stats. Ironically, he is quite slow in this game, while he is quite speedy in the Sonic games. Again, Tails participates in the Olympic events, this time in Mario & Sonic at the Olympic Winter Games, the sequel. Tails is a Skill type player again. His stats are given on the official site as well. 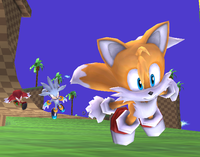 Tails made an appearance in the adventure mode of the game for the Nintendo DS. In the game, he decides to help Sonic and Mario on their quest. Tails even makes remarks about Mario when he and Sonic first meets the fox, thus showing that Tails respects Mario due to his heroism (similar to how he respects Sonic). In the third installment of the Mario & Sonic series, Mario & Sonic at the London 2012 Olympic Games, Tails makes another appearance as a playable character. He is a Skill type player in the Wii version like the two previous installments and is part of the Heroes in the 3DS version. This is the first game in the series to introduce Kate Higgins as the new voice actress of Tails (who takes over from Amy Palant). Tails appears in Mario & Sonic at the Sochi 2014 Olympic Winter Games. Like previous games in the series, Tails is a playable Skill type character. Tails returns in Mario & Sonic at the Rio 2016 Olympic Games as once again a Skill type. In the Nintendo 3DS version he's exclusive to 100m Freestyle and Beach Volleyball. Tails's appearance in the background of Green Hill Zone. In Super Smash Bros. Brawl, Tails appears in the background of the Green Hill Zone stage, as a cameo. He can occasionally be seen running through the loop in the background, alongside fellow Sonic characters, Knuckles the Echidna and Silver the Hedgehog. Tails also appears in the form of a collectible trophy and Sticker. Tails reprises his role from Super Smash Bros. Brawl in Super Smash Bros. for Nintendo 3DS, running in the background of Green Hill Zone, along with Knuckles the Echidna and Silver the Hedgehog. Tails makes an appearance in Super Smash Bros. for Nintendo 3DS / Super Smash Bros. for Wii U as a Trophy in both versions of the game. 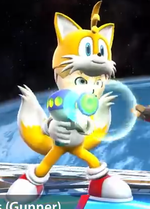 An outfit based off Tails' appears as an outfit for Mii Gunners in Super Smash Bros. for Nintendo 3DS / Wii U. It has been released in February 2016, alongside a Knuckles outfit. In Super Smash Bros. Ultimate, Tails once again appears in the background of Green Hill Zone alongside Knuckles and Silver. He also appears as a Spirit. Sonic's buddy Tails the fox can fly thanks to his bushy tails, and he possesses a wide range of Skill-based abilities that will make him formidable in a wide range of events. He can jump and accelerate well, so he will be tough to beat in many races. Miles "Tails" Prower is Sonic's best friend and always at his side. An ace pilot and mechanic, Tails returns to the Olympic Games with the Tailspin ability on the Wii and DS to spin his tails like a helicopter and propel himself in the air, as well as the Propeller Dash ability on the DS. Sonic's best friend and buddy Miles Tails Prower is a fox that can fly, thanks to his bushy tails, and he possesses a wide range of Skill-based abilities that will make him formidable in a wide range of events. He can jump and accelerate well, so he will be tough to beat in many races. SONIC THE HEDGEHOG 2 A friendly fox with two tails whose true name is Miles Prower. He can fly for a limited time by spinning his tails rapidly. Originally impressed by the sight of the speedy Sonic, Tails became his sidekick, rarely leaving his side. To assist Sonic in staying one up on Dr. Eggman, Tails utilizes his knowledge of electrical engineering to create mechanical devices. Miles "Tails" Prower (EU) Sonic the Hedgehog 2 (11/1992) GCN Sonic Heroes (01/2004) This gentle-hearted little fox used to get bullied because of his two tails. Then one day he saw Sonic on West Side Island and decided to join him on his adventures. Now he's an expert mechanic and a partner Sonic can really rely on—he's come a long way since his timid, quiet beginnings! For this subject's image gallery, see Gallery:Miles "Tails" Prower. "Miles Prower" cyrillization of Japanese name. This page was last edited on March 31, 2019, at 22:13.